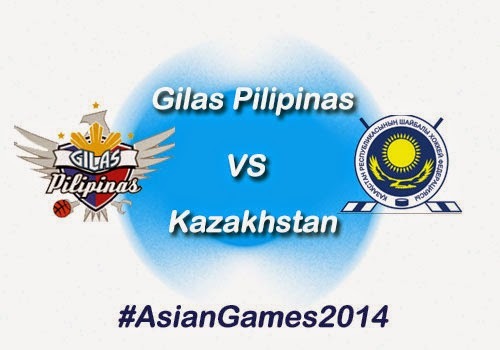 This is the 3rd game of Gilas Pilipinas for quarterfinal round, they're facing today the team Kazakhstan. The door for semifinal stage is now open for our men's national basketball team after Kazakhstan defeated Qatar yesterday. According to Interaksyon, "The Qatar loss made it possible for the Philippines to force a three-way tie for the second spot if they can defeat Kazakhstan on the final quarterfinal playing date tomorrow and Korea can hand Qatar another loss." Gilas Pilipinas was defeated by the host of 2014 Asian Games, "South Korea" with a score of 97-95. This third game of our men's basketball team in quarterfinal round can be watch live at exactly 2:15 PM (Philippine Time) through TV5 Kapatid network. Or watch live coverage of the game through online, you may try this link. Now! if you keep this page, you'll be updated by tweets of my fellow Twitter friends. Good news! Gilas Pilipinas win against Kazakhstan by 2 points (67-65). But sad to say, they failed to enter semifinal stage cause they need to meet the average score of at least 11 points ahead their opponent. Comments or suggestions about "2014 Asian Games: Gilas Pilipinas vs Kazakhstan Game Results, Highlights & Video Replay" is important to us, you may share it by using the comment box below.